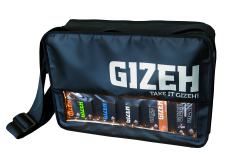 Plan Concept was assigned with designing a bag for its customer Gizeh, which literally illuminated the company’s smoking accessories and the promotion team at summer festivals. In cooperation with the Bielefeld-based promotional bag specialists Halfar®, a bag was developed from truck canvas that features a film window and an LED light panel, which not only allows the promoter to be recognised a long way off, but which also graphically illuminates Gizeh’s products. Furthermore, the promotion bag measuring 45 x 35 x 15 cm that was distinguished in the category Custom-made Designs is also equipped with a black strap and two splashwater-proof zips running parallel to each other with a connecting handle on the upper part of the bag. A large main compartment for loose items is located above the film window, the bag also feature a further insert compartment with a stretch fold and a sewn-on zip-up pocket as well as a mobile phone compartment. In the bag’s interior, a detachable and reinforced panel which neatly divides the contents into five sections is located behind the film window.